Let's say you're a chef. Not the hamburger-flipping kind, but a star chef with your name on a restaurant or two, maybe a cookbook and a TV show. You spend your evenings crafting elegant meals, layered with sophisticated sauces, topped with delicate garnishes, paired with expensive wines. Kitchen closes. You could go somewhere soft and refined, relax to soothing music and a nice drink, maybe have a cigar. Or you could go to a smoky bar, packed with people and noise, where they feed you a big old plate of pork chops. And you can have a cigar. served pupu-style with ketchup and cabbage . That's the fascinating thing about Side Street Inn, an unassuming, non-descript place in Kakaako that just happens to be the favorite hang out of the most accomplished chefs in the islands. This is where Roy Yamaguchi and Alan Wong, masters of Hawaii Regional Cuisine, were singing "Chotto Matte Kudasai" into karaoke microphones very late on a recent Tuesday night, after two (or was it three?) rounds of vodka shots and piles of pork chops, chicken gizzards, fried rice, smoked pork and sashimi. "The food tastes good -- straightforward, not contrived. Very local ... it hits home," Wong says, and you know he has to be a tough critic. "The most important thing is taste and flavor, and it's there." The godfather of this place is Colin Nishida, who has managed to create a somewhat surreal space where the food has grown legendary and where sports fans, off-duty professionals and stressed-out restaurant magnates alike can eat, drink, smoke and sing in total relaxation. That was his goal coming in: "Build a local bar with good food, good service. A safe bar where women and men could come in. Not a hostess bar, not really a man's bar, not really a women's bar." Yamaguchi's birthday celebration at Side Street Inn. Not exactly a definitive mission statement, but by any measure, Nishida has succeeded. He opened in 1992, just when the local economy started its slide into the nether regions. Side Street's life history spans the recession, yet this little hideaway thrives. Nishida has just closed a deal to open a second Side Street in the Amfac Center, to open in November. "It'll be called Side Street at Amfac, or something like that," Nishida says. The location is a two-story space formerly occupied by Yokozuna restaurant and a bar called the Landings, which closed about eight years ago. He plans a menu scaled down in portion size and price, geared more to a breakfast, lunch and happy-hour crowd. Hours will run from early morning to about 9 p.m., as opposed to Side Street's 2 a.m. closing. "It's not like you go out to eat downtown," Nishida says. "You try to escape downtown. More people are trying to relax, wait for the traffic to die down." But back to the chef thing. Nishida says the first one to discover Side Street was Wong, who came in with a mutual friend, who dragged Nishida out of the kitchen one night to meet the hot chef. "I said, 'Hey, howzit, nice to meet you.' "
Did he know who he was talking to? "No." Wong kept coming back; the two talked business a lot, became golfing buddies. "Alan brought his chefs and it kind of got bigger and bigger." Bigger, as in Wong brought Yamaguchi, and then came Russell Siu of 3660 on the Rise, Hiroshi Fukui of L'Uraku, Philippe Padovani of Padovani's Wine Bar and Bistro (who calls the fried rice "Kalihi rissoto"), master sommelier Chuck Furuya ... a long list of very discriminating palates. "People think chefs like to eat only fancy, very complex food," Wong says. "In reality, chefs look for very simple stuff. That's what Colin provides." "It's tasty, reasonably priced, generous portions," Siu says. "It's comfort food," Fukui says. As for Nishida: "He's the man." A man, by the way, with no formal cooking training, other than that provided by his mother -- "Gotta learn to cook rice. Come home from school, cook rice." If he's intimidated by serving these chefs, it doesn't show. And he stops by to judge their restaurants whenever he can. "Alan's probably the best, but he doesn't have a smoking section. So Roy has to be No. 1 because he does." 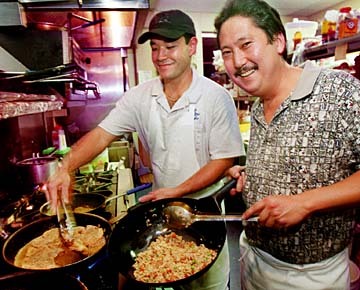 Prior to Side Street, Nishida was a partner in a plate-lunch place called Take's and tended bar at the Ala Moana Hotel. Side Street opened with four partners; only Nishida and Robert Takemoto remain. "I've been in the restaurant business since 16, that's the only thing I really know, the only thing I really bank my money on," Nishida says. "The beginning was rough. We worked 17, 18 hours a day, seven days a week." His first day off was two years into the project. Things turned the corner late in in 1993, when Side Street achieved steady, reliable patronage and success. "Timing was real important, when we opened this place. 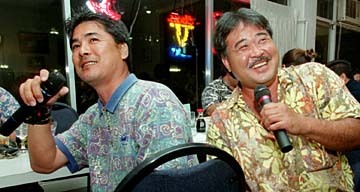 A lot of local bars -- Buddy's, Kapiolani Grill -- were closing," Nishida says. "Side Street opened at the right time" for this concept. In the beginning, the menu had five items -- teri chicken, fried rice, yaki soba, New York steak and a fifth item Nishida can't remember. Today's menu lists 68 choices. "When we opened, food was free because we couldn't decide on the price -- and it was all friends coming in." That's changed, partly due to the attention brought by the chefs, largely because of a featured spot on "Local Grinds on the Town," an Emme Tomimbang TV special. Side Street went from hideaway bar to honest-to-God restaurant. Nishida now sells 300 to 400 pounds of pork chops a week. A plate of that specialty now goes for $13, the famous fried rice is $8.25. But you can feed an army with this food. 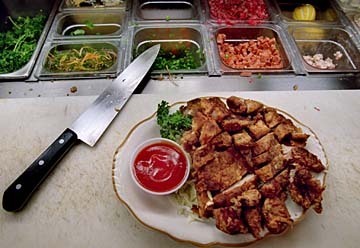 "Everybody always orders too much the first time they come," Nishida says. On the personal side: Nishida still works all the time and things will escalate when Amfac opens. His family, he says, is "six dogs and a girlfriend. She's very patient." And his mother, who still makes all Side Street's wonton. Back again to the chef thing, the premise behind this little excursion down this particular side street. It's Tuesday night, and the long front table is reserved for "the chefs" -- Wong, Yamaguchi, the whole bunch that wine master Furuya calls "the mongoose pack." Everyone's got a cellular phone and they chirp regularly. These are people with empires to run. 10:25: Second round of vodka shots; start filling out karaoke song list. Yamaguchi looking for "Hey, Hey, We're the Monkees." 10:45: Wong sings "Baby Blue" -- "She wrote me today that she won't come back to stay, that she's only come to pick up her clothes ..."
Various barely legible notes until 11:55: "Chotto Matte Kudasai," Alan and Roy ... "Please excuse me while I cry. Seems sayonara means goodbye, but no one ever told me why." "Food goes with friends, friends go with food. What makes this place special is food you can share with friends," he says. "There are places like this all over the world, but this is where my friends are." Motto: "Simple food, done right." Coming soon: Side Street 2, at Amfac Center, opening in November. Colin Nishida doesn't write down his recipes, and he doesn't measure much, either. "Everything here is by taste, so If I'm sick, if I have a cold, everything's salty," Nishida says. Securing these recipes required standing next to him in the kitchen of the Side Street Inn, writing down everything he threw in the pan and guestimating quantities. These recipes should be close, though (he wasn't sick that night), and they are for three of the restaurant's most popular dishes. Nishida's secrets: fresh island pork in the chops and hon dashi in the fried rice. Plus peas and carrots. "That's my favorite." Combine garlic salt, pepper, flour and cornstarch. Coat chops well in the mixture. Heat oil in a skillet. Fry chops about 10 minutes, turning frequently until browned. Cut meat from the bones and slice the chops into bite-sized pieces. Serve over shredded cabbage with ketchup on the side. Include bones for gnawing. Serves 4. Dry rice in the refrigerator or freezer 1 day. Brown sausage and bacon in a large skillet. Add rice and mix well. Add onions, peas, carrots and char siu; mix. Add oyster sauce, salt , hon dashi. Serves 4. Note: For those sensitive to msg, use a saimin or shrimp dashi that has no msg. Leave out salt. Combine marinade ingredients and marinate gizzards 24 hours. Crack egg into gizzards and mix well. Mix together flour and cornstarch. Dredge gizzards in flour mixture. Fry in oil heated to 350 degrees until crispy, about 4 minutes. Serves 6 as an appetizer.